Today we begin a long series of episodes to finish out the year, all focusing on Western Front during 1917. I will be honest and say that I have held these until the end of the year because I was suffering from some serious Western Front fatigue at the end of last year, after the Somme and Verdun took up so much time. However, we are back in the west now and the next 9 episodes will cover 3 primary topics the first of which is the spring offensives launched by the British and French. 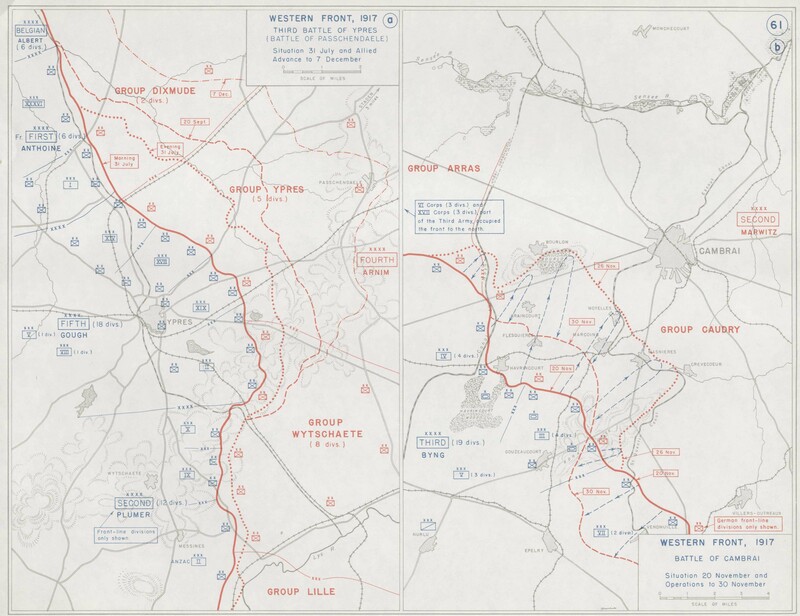 These actions would contain the battles of Arras, the action at Vimy Ridge, and the offensive that would come to be called the Nivelle offensive. Once this attack is over we will discuss the French Mutiny of 1917 which saw the French army almost collapse. After the Mutiny we will shift our focus north to cover the Third Battle of Ypres which will then culminate in the battle of Passchendaele. Most of that is in the future though, and today we will be focusing on setting up all of those action, and that means taking it from the top of the year, and a bit at the end of 1916 as well as the British and French were deciding what to do in the year ago. We will also discuss how Joffre was replaced as French commander, and then talk about Nivelle and his new plans for the coming year, a year that he believed would bring a victorious end to the war. To begin our discussions of the 1917 offensives we have to turn back our clocks all the way back to right around the time that the Battles of the Somme and Verdun were winding down in November 1916. It would be on the 15th of that month that the Entente leadership would get together to discuss their plans for 1917. This meeting would contain both military and political representation for nearly all allied countries. These two groups would sort of break off to start, and in the political meeting the political leaders of Britain and France, including Asquith, Lloyd George, and Briand all got together and agreed that they should be taking more initiative and asserting themselves more in military matters. For the British politicians this meant continuing to push for more help to be sent to the Russians, and attacking out of Salonika and into the Balkans. Unlike in previous years they found some support from the military side when it came to attacks against Bulgaria. This support came from Joffre who believed that Russian and Romanian troops should be used to attack from the north while French and British troops would advance from the south. Remember this was in that brief window after Romania declared war but before it was crushed by the combined armies of Germany, Austria-Hungary, and Bulgaria. This attack on the Balkans would be just one piece of what Joffre hoped would be a coordinated series of attacks from all of the countries against the German and Austro-Hungarian armies. This was pretty much the same plan as they had for 1916 before the Germans started that whole kerfuffle around Verdun. To try and make sure his plans were not pre-empted again Joffre wanted to start the attacks in February, but the other leaders were hesitant to commit to such an early date. They were still catching their breaths from the events of 1916 and believed that it would not be until spring that further attacks could be launched. We know that many of these planned attacked would fail, because we have already covered them. The Romanian attacks would not even be launched after their collapse in December. In Russia any efforts were put on hold due to the revolution, and when they would finally attack in June their efforts were anemic at best. 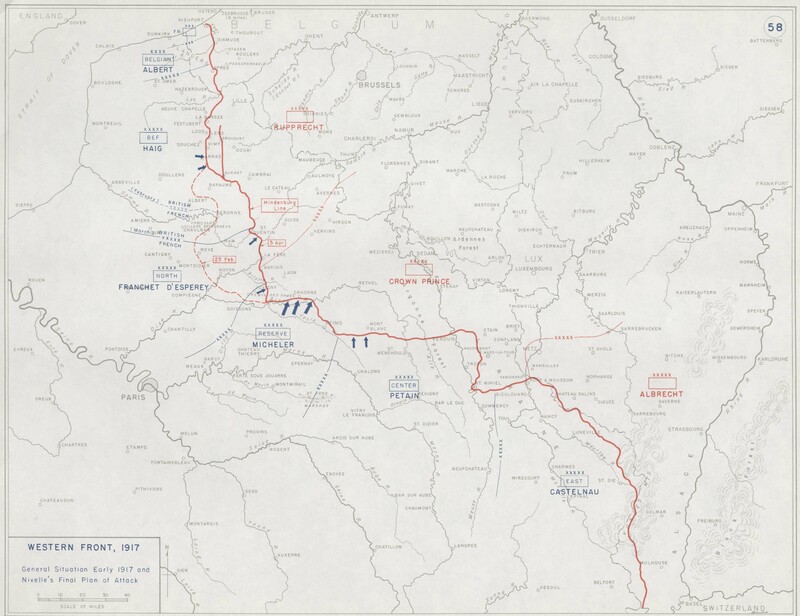 In Italy these plans would result in the 10th and 11th battles of the Isonzo, which would see the Italians at a high point, they would push the Austrians back and push them to the breaking point, but they were not victorious. That just leaves us to cover what happened in the West as part of this grand scheme. While the British and French had got their grand strategic plans on the table, there was also detailed planning to be done that involved just their two armies. They began with an outline of a plan that had initially been created way back in September with the main focus of the 1917 attacks being around the Somme battlefields of 1916. To the north of the Somme the British would commit 2 armies while to the south the French would commit 3. There would also be other attacks along the front, with the French sending an army at the Chemin des Dames near Reims and then the British planning to launch an attack in Flanders later the year, and attack that would morph into Third Ypres. At this point Nivelle was still the army commander in charge of the Verdun front, these attacks were not part of Joffre's plans and he would reject them. He did given Nivelle the consolation prize of telling him that he should put pressure on the Germans around Verdun, but that he would not be launching a full blown attack. Along with future plans the French also spent some time reorganizing their army. During the winter each of the French army divisions was reduced from 4 to 3 infantry regiments and their heavy gun compliments were increased. While the raw manpower was lower in each division they were given greater firepower capabilities to try and compensate with more machine guns and the new 37mm gun given to each infantry regiment in the front lines. Along with this reorganization came what would turn out to Joffre's last memorandum on offensive doctrine. This doctrine revolved around attacks occurring on as wide of a front as possible with the goal of reaching the enemy's artillery. By this point Joffre was of the belief that these attacks should be done in well thought out, methodical, stages because that was the only way to work through the layers of German defenses. Each attack should be well thought out and supported but the time between them should be kept as short as possible to prevent the Germans from recovering between blows. It was also around this time that the first widespread reports of reduced morale in French units began to be noted by censors who were monitoring letters sent by the soldiers from the front, while at the time it was a small trend, it would be very important in just a few months. While all of the initial planning was done in November, by December the situation began to change rapidly. The first domino to fall was Romania. On December 6th Bucharest fell, ending any hopes of an offensive again Bulgaria from the north. This was just the last straw for Joffre, the French Chamber of Deputies had been meeting from November 28th to December 7th and on that the final day Briand realized that if he hoped to save the government he would have to find a way to remove Joffre. Even at this late stage in the war, and after all of the French failures, the French political leadership could not just dismiss Joffre, he was still too much of a hero in the country. Instead of pursuing his removal they instead pulled the same trick that Joffre had used to remove Petain from Verdun, they promoted him. Since there was not really a position to promote Joffre to, they had to create one, this new position was given the role of coordinating the military efforts on the various fronts were French soldiers were participating. This position was offered to Joffre, as well as a promotion to Marshal of France both of which he would accept. Briand would also replace his Minister of War, which allowed him to barely survive a vote of confidence, just barely. These changes would give the government a respite, at least for the moment. For Joffre, the war was basically over, as it turned out his new position had no real power, and he had nothing to do really. Joffre seems to have mostly accepted this and spent the rest of the war barely involved, mostly just preparing his voluminous memoirs and visiting allies. For Joffre, the Hero of the Marne, it was a kind of anti-climactic way to exit the stage, but when compared to how his success would exit the stage, it was not too bad at all. Joffre's replacement was General Robert Nivelle. Nivelle was an interesting choice, he was certainly not the most senior option, Joffre's chief of staff de Castelnau took that crown. He was also not the most experienced with there being several senior French generals like Petain who had been in command of Corps and Armies for the entire war. All of these other options fell into three broad categories, they were either not very highly regarded by the rest of the army, they were Catholic, or Briand just did not like them. Nivelle was well known both in the military and in France as a while due to his role in the capture of Douaumont and Vaux at Verdun, and then the follow on success of the French offensives near the end of that battle. The French did not at that point fully realize what we do today, which is that by the time Nivelle was launching these attacks the German army had already shifted most of its strength elsewhere which inflated Nivelle's victories beyond where they normally would have been. Nivelle was also recommended by Joffre to be his replacement, which carried at least some weight. To say that history has not been kind to Nivelle would perhaps be an understatement. We have even recorded his greatest failure with his name attached to it, it would be like calling the Battle of the Somme Haig's Offensive. But Nivelle had some serious shortcomings that the French should have been well aware of, here is Robert Doughty from his work Pyrrhic Victory to explain "With the outcome of the war at stake, France's political leaders had placed all their bets on an officer with no experience as a strategist, little understanding of how to work with allies, and only six months experience as an army commander." One thing that Nivelle was not lacking was confidence, and right up until the end of his stint as French commander it would maintain that confidence. Overall, what Nivelle planned to do was different from Joffre, sort of, or at least what Joffre was trying to do in 1917. The differences between the two generals was Nivelle's belief that instead of a series of successive efforts the correct path was to do it all in one continuous thrust. In his work Breaking Point of the French Army: The Nivelle Offensive of 1917 David Murphy gives a bit of information about why this was the case "He abandoned the idea of an offensive across a broad front, composed of a series of slow and ultimately costly attacks. Successive attacks in such methodical battles had proved ineffective as it allowed the enemy time to regroup and counterattack and also to gather artillery to counter further Allied attacks. Instead, Nivelle wished to expand the methods that he had perfected at Verdun. He would mass artillery in order to devastate." In The First World War John Keegan would go into a bit more detail "Nivelle was an officer of artillery, by 1917 the premier arm of trench warfare, and he had convinced himself that new artillery tactics would produce “rupture.” Under his control, a vast mass of artillery would drench the German defences with fire “across the whole depth of the enemy position,” destroying the trenches and stunning the defenders, so that the attackers, advancing under a continuous barrage and by-passing surviving pockets of resistance, would pass unopposed into open country and the enemy rear area." A key point of this attack was that Nivelle was focusing on a much narrower front than Joffre. One historian I have read would describe the differences by saying that Joffre was using a steamroller while Nivelle was wanting to use a sharp sword to get through the German defenses. All of these advances would also be done very quickly, and he believed that it should not take more than 48 hours to penetrate the defenses. 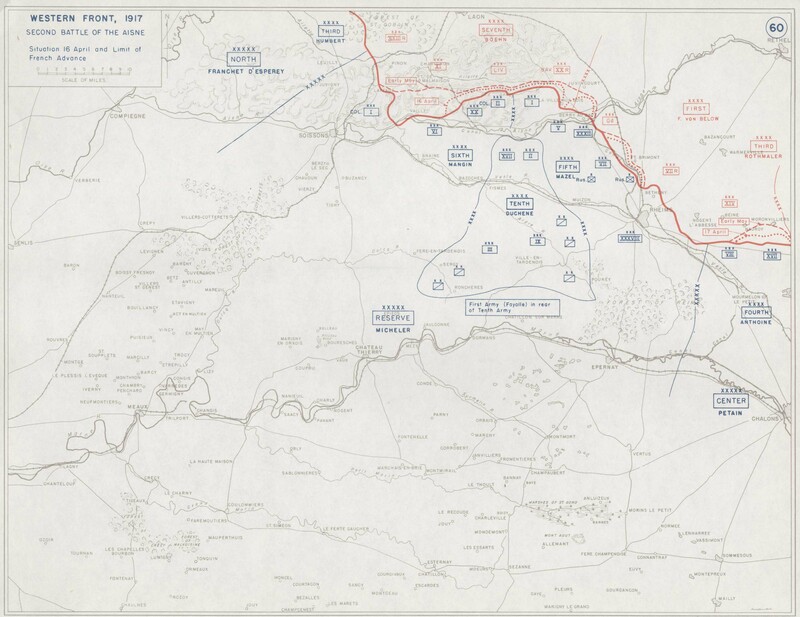 Once they were through the lines, Nivelle would then push a large maneuver group through the rupture, and they would begin a series of lateral attack to roll up the German line. Nivelle himself would write that "This objective is the destruction of the principal mass of the enemy's forces on the Western Front. This can be attained only by a decisive battle, delivered against the reserves of the adversary and followed by an intensive exploitation." It is important to note that Nivelle was saying that the primary point of his attack was not to gain territory or a specific geographical advantage but instead to destroy the German army, this was the same goal as Joffre and other generals had landed on by the end of 1917, Nivelle just thought he could do it far faster. When I read the descriptions of what Nivelle was planning to do I cannot help but compare it to the French strategies of 1915 in Champagne and Artois where they believed that they could start attacking and then just keep attacking, mostly ignoring the logistical and exhaustion issues that would come along with trying to keep an attack going through the German positions. There were some differences between the two strategies, but only in details. It almost seems like a pipedream, Nivelle just seems to have believed that if he hit the Germans hard enough in one spot he could easily punch through their lines and then Bob's your uncle you are home by Christmas. With their new leadership the French, and specifically Nivelle, really needed to make some changes to the 1917 plans that had been discussed with the British in late 1916. This did not change the French reliance on the British though, and Nivelle still needed them for two separate reasons. The first of these was because he needed the British to take over more of the front, he was hoping they could take over 32 kilometers. At this point the French were still manning the vast majority of the Western Front, and as the British army had grown so much in the previous 12 months it only made sense to the French that the British should take over more of line. Haig initially only wanted to take 13 kilometers but he was eventually talked into the whole 32. Nivelle also needed the British to attack, which they had agreed to do. Much like Joffre before him Nivelle also really wanted the British to be subordinated under him, but also much like Joffre he would fail to make this happen. Instead all he got was the agreement of Haig that he would attack in Arras just as he had agreed to do with Joffre. There was another meeting in Calais in February where Nivelle's plan was discussed with the British in some detail. At a high level, and we will dig into the details of the plan next episode, Nivelle still planned to attack south of the Somme and on the Chemin des Dames. He was also building his plan on three assumptions. The first was that the methods that had worked so well for him at Verdun when he was attacking with just a few divisions could be scaled up to be successful with an entire Army Group. Second, that the French army's ability to launch a hard, fast, and surprise offensive would overwhelm any possible German defenses and plans. Finally, and this is the really big one, that the basics of his strategy was not dependent on terrain or German positions, it could almost blindly be applied anywhere along the front. With these assumptions in mind lets talk a bit about where the attack would be takin g place. The Chemin des Dames was a ridgeline on the Aisne river that was 40km ling and at least 180m high. It was apparently named the Chemin des Dames, or Ladies Path, because it was a favorite riding path for the daughters of Louis the 15th. Just the fact that the ridge was 180 high was problematic because even if the infantry could take the ridge, which was no guarantee, it would be hard to move the artillery and supplies forward to support them as they continued to move forward. Just to make things a bit more difficult they French would have to be attacking over and around the Aisne river, the French did have a 20km wide bridgehead over the river but for the most part the eastern back was controlled by the Germans and would have to be taken during the attack. On top of this, the Germans had of course spent a good amount of time preparing their defenses, and they would be ready. Nivelle ignored most of this, he insisted that his methods would work even in this difficult environment, in fact he expected them to work in just a few days. While Nivelle had the military situation, he believed, on lockdown, at this point in the war after the huge defeats of 1915 and 1916, it was critical to get and maintain the support of the political leaders of both France and Britain, and this would be a constant challenge for Nivelle in the early months of 1917. Before we get to some of those discussions though, let's quickly jump back to the requirement of the attack, that the British had to support it. To gain full support of the British, both politically and militarily, Nivelle would go to London in mid-January. There he would meet with the British War Cabinet, including the new Prime Minister Lloyd George. Lloyd George had always favored a solution to the war that was as far away from the western front as possible. For 1917 that meant support for an attack out of Italy or an attack out of Salonika. Lloyd George favored the Italian option and believed that the best path forward for 1917 was for the British and French to send a whole bunch of artillery to Italy, where the Italians would use it to smash through the Austro-Hungarian defenses. This would take the Austrians out of the war, hopefully, and would leave the Germans to stand alone, isolated from their allies in the Middle East and Balkans. Even though this was Lloyd George's preference, he had not yet consolidated his support enough since the creation of the new government in late 1916. This meant that he could not yet really push too strong for anything, not yet at least. When Nivelle met with him in London is apparently wooed the British Prime Minister and the rest of the British War Cabinet enough that they put their full support behind his plan. His talk of sweeping movements, of cutting through the German lines with artillery to create corridors to allow for the mass of maneuver into the enemy rear were all very good sounding ideas, and very seductive at a time when all that that the British had to look forward to was another year of attrition. If only he could make them happen. While Nivelle had the full support of Lloyd George he still had some work to do to properly coordinate with Haig and the BEF. Saying that the British and French would coordinate their attacks was easy, actually making it happen was something else entirely because the devil was in the details and it started with a simple question, when should the attack take place? This conversation would almost instantly lead to changes, with the initialy February start date pushed back to mid-April. On February 27th a meeting was held, and it went back to the good old topic of unified command In this instance the representatives of the two countries met and during the course of the meeting Lloyd George was given a note asking him to put the BEF and Haig under French command. There were benefits to this arrangement, coordination would be far easier. At this point the conversation was strictly a political one between Lloyd George and Briand, when Haig and Robertson found out about the note they exploded. That night they met with Lloyd George in his room and made it very clear that this was not a situation they were in favor of. Haig made it clear to Lloyd George that he believed that any government that put the BEF under French command would not stay the government of Britain very long. Haig and Robertson would discuss the matter in private and considered resigning if any move was made to subordinate the BEF. These threat alone would have made the proposal pretty much dead in the water. The next day Haig discussed the matter directly with Nivelle. Later Haig would write that Nivelle was appalled at "the insult offered to me and the British army by the paper which Briand had produced. They assured me that they had not seen the document until quite recently." Like several other pushes for unity of command, this move had failed, for the rest of Nivelle's tenure as commander of the French Armies, his relationship with Haig would best be described as icy. There would be no great coming together for the common good between the French and British at the least not yet. Up until this point things had been going pretty well for Nivelle. Sure, maybe he did not have command of the British armies, but they were going to help. He had the full support fo the French political leadership and things were looking rosey. Then something happened that completely caught the British and French off guard, the Germans retreated, voluntarily. In early March the commander of the French Northern Army Group, General Franchet d'Esperey noticed that the Germans were preparing the withdraw. He did not know the full extent of what was about to happen, but he knew the Germans were getting ready to pull out. This was a German retreat from most of the Noyon salient, a fully planned action that brought their armies back and into the Hindenburg line. Even after the retreat began Nivelle refused to believe that the Germans would retreat on a large scale. This was especially true of the German positions on the Noyon Salient since it represented the closest German positions to Paris. d'Esperey pushed Nivelle to scrap his plans for later the in spring and instead launch a surprise offensive. This might have caught the Germans off guard and turned their planned retreat into a wider victory for the French. Nivelle refused, he told d'Esprerey to keep up some pressure on the Germans as they moved back, but not to launch any large attacks. With the Germans voluntarily vacating the salient the future of Nivelle's offensive should have been a bit in question. 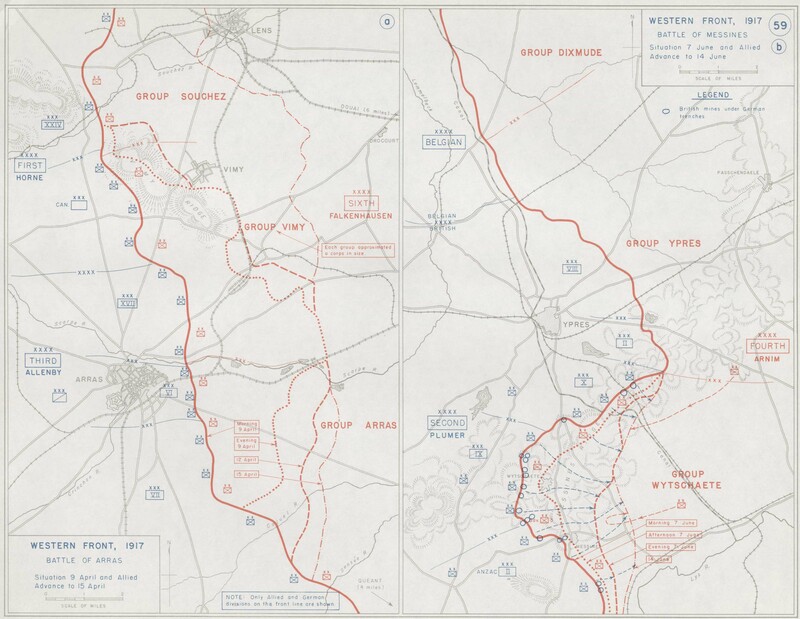 The entire point of the plan, of the British attacks in Arras in the north and the French attacks in the south were designed to meet on the eastern side of the Noyon Salient to trap the Germans, and now that salient no longer existed. Even with this objective now gone, he put more focus on the Chemin des Dames. I quite like this quote from Breaking point of the French Army by David Murphy when discussing Nivelle's reaction at this moment "It was a classic example of strategic ‘tunnel vision’. Having formed a plan, Nivelle seemed unable to deviate from it, despite the operational advantages of doing so in this case. It was a problem that would resurface later." Next episode we will continue our story, to see perhaps when that problem would resurface.